Rita Patel is a CPA turned self-taught artist, designer and cook. In everything she does, her approach is try and help people see what is possible. She says that knowing that there are possibilities no matter the situation (even when we do not know the specific types) keeps our internal spark going. Our interview was conducted via Skype and email; the Skype conversation is first, then the email, with similar questions and answers intermixed. Sometimes, we run out of inspiration. And we go back to the well, and the well is temporarily dry. But when we interact with other creatives, and start asking them where their inspiration comes from, discovering what works for them, it gives us new ideas. In my office hangs your indigo Ganesh print. I have several such images in my office because people have given them to me over time, and all of the others have very distinct lines, the concept of line seems very important in all these other representations, and some are deeply embossed with gold, with this sort of polychrome aspect. And there’s something about the blurring of the line, the sense that the image was cast and recast, that it wasn’t supposed to be defined. I love that it is indigo, so it seems watery, as though I’m supposed to let it be absorbed into me, or that I’m supposed to wash into it. I’m probably reading way too much into it because I live with it, but I love the indistinct lines and the way that form overtakes everything else. And I very much like that. I like the ethereal and the quality of things not being fully defined. I think what you just shared with me – your experience of the work – is what matters. I just like to set the space for it, and what you feel is what you feel. I didn’t draw that whole image. I recast it, like you said, and did my own work on it. It’s really about movement, in a lot of different ways. I live with other work that is much more representational and definite, and I don’t have the same connection with them. The connection is not as fluid. So thank you. I love to hear how people feel. I think it’s because it is not defined for you that you get to have a relationship that is different than it would be if it were representational. So when did you start creating, and when did you know that you wanted to be, … or felt called to, create? I think there is no time where I did not feel it. For me, I have had a firehose of ideas arising especially if I am engaged in creating – one feeds into the next in a blooming way. I think I’ve always been creating. I don’t know when I started. From my earliest memory, I remember creating, either imagination-wise, or in terms of scenarios and stories, or physical work, whether it was making something, drawing something. If I look back, I think I was always doing something like that. My sister has better, or maybe more, memories of that than I do, from our childhood (she is a year and a half younger), and she talks about how, every day, it would be like I would write a whole play. I think it is just what I am. When you describe yourself as an abstract artist, when did that come into play, and why and how does that work itself out in your creative life? I think it came into play when I started painting, which was when I was 29. And the ten years before that, I had not really done any sort of creative work. I had stopped writing. I wasn’t drawing. I was in grad school at the time, and I had wanted, once I finished grad school, to take art classes. Because I’m self taught, I’ve never gone through any sort of defined program. So my then-boyfriend bought me these painting classes. They were not where you are taught how to paint. It was basically studio time. And twice a week, the artist assigned to that area would walk around, and sometimes he would say something. But it wasn’t where I was taught technique. And it was really interesting, because I’d never painted before, and I didn’t know there were different paintbrushes for different paint. I didn’t know what a palette was. So I just started. And my first two pieces were much more defined, where you could see what it was, but it wasn’t representational in the sense that it was something that actually existed. The second painting was just a composite of butterfly wings, patterns I had made up, not necessarily something you’d see in nature. In the environment where you categorize work and people, abstract artist seemed to fit the best. But sometimes I describe myself now as more of a conceptual artist. I think that makes more sense with the way my mind works and the way I create. And if we think of some of the more formal definitions of the abstract in art, and abstract expressionism, yeah, conceptual might be a better fit. I’m thinking of a few pieces I saw a few years ago in the Hamsa Yoga studio, and they do seem more conceptual. They are just so expressive. Tell me about your shows. I’ve had regular shows since 1999, but my most recent show here was four years ago. Some of my work is displayed on loan in different places, not really part of a show. I’m just not excited about the current pieces I have as much as I am about something new to show. Because I’ve had them for awhile. It’s the first time I’ve had artwork for so long that hasn’t sold. Tell me about that. What is it like to have the work, as you say, for so long, and does it look different to you after a while? You know how it is when you’ve created something that is relatively fresh, and you are still excited about it, and then someone else falls in love with it, and they take it off your hands. And they start living with it. So it leaves you when you still feel this level of excitement for it. So you have – permanently – a different relationship with that piece. How is it different when you hold on to it? You were excited about it, and now you’ve had it, … how is that relationship different? I’ve had some paintings a very long time. And I think it’s because of the type of style that I have that it’s an ongoing relationship. Because even I am seeing new things in my work. Even if it is ten years later. With some of these pieces that I have now, I think it’s more specific to them than having something for a long time. And I just realized this two days ago. But I think it is because the last few years have difficult in terms of my artwork. It’s not that I wasn’t inspired, which is something that I think a lot of people go through at some point. It was just that I was not creating. I have a studio here in our home, and I wouldn’t even walk in there. Months would go by. And what I realized was that my whole life I had wanted to be accepted as an artist, and I fully changed my whole world to live that way by moving to Michigan. It is the one way I can totally express myself. And I do not know that this is unique to me. I think everyone has this limit, where you can’t always be your whole self given the circumstances of social environment or family or work; there are different aspects of you. But with my art, it is one way I can just be without having to make somebody else comfortable. In my quest to just be, and not have to be in corporate America or will I be happier if I go to this school, or I don’t know if you know but I have a very strong business background, I am a CPA. And that is all for other people. So my vision was to have a design house, to be a designer and have that as my business. What happened there was I was no longer expressing for myself. Instead of having one of a kind custom goods, it becomes about the other person. What they want. And sometimes people have no idea what they want. So it became not even uninspiring. It was just completely depressing. And I didn’t realize that until two days ago. So now I know that, whenever you’re creating, you’re drawing, painting, playing music, it’s just that fear of messing up the blank, beautiful paper. I have that sometimes. I get over it pretty quickly. I think that is what it was. I was trying to justify everything that I put down or created as a way to make money. And that is the one thing I didn’t want to do. And it was all because of me, and the way I logically thought it through. That’s so fascinating – because I’m just coming from that world, and the journal is my design studio, right? – because it echoes my approaches to reclaiming my own life. But when you’ve been in that world for so long, and the only value that any object produced might have is its monetizable value, is it replicable, is it monetizable, when that is the value, and when we produce for consumption, there is something so starkly different Even if the thing we produce is beautiful and people love it, the spirit in the production is different. Aveline Kushi has this to say about cooking – this idea that the spirit of the cook lives in the food. And you know that very well. You know, some people think, I’ll just work it out in the kitchen. I’m in a bad mood, or I’m cranky, or I have a dark cloud, and whatever it is, and I’ll just work it out in the kitchen, leave me alone. And the meal that results makes everyone grumpy and dark cloudy. So Kushi says it is so important to have a beautiful clean kitchen, to have a beautiful clean mind, to have the right spirit, when you are producing things for consumption. I think our creative practice has to have the right spirit or something is really off. So how do you draw that line between your logical CPA mind and your creative mind? Is there a switch you have to turn off sometimes? Is it an intention that you manage in your daily sit? How do you deal with that? It’s actually … the idea has to resonate with me. And if it resonates with me, meaning my spirit, not necessarily what I am thinking, then it’s going to resonate with other people. And that’s the problem with the work that I have right now. I created it with mixed energy, so I think people think it’s really beautiful, but maybe that’s why I haven’t really sold as much as I normally do. Or maybe it’s my energy around it. So what I’ve found is the idea of play, the idea of fun. To create just for the sake of creating, and not to have any sort of agenda. And it is hard sometimes to get to that, but it isn’t hard if I’ve decided I’m going to paint at 5 o’clock today. Then I’ll just walk in and start doing what I’m doing. I learned early on that if I have a preconceived idea of something it never works out. So it’s the same thing with your mind, or your logical mind. If you try, and that’s what I feel the CPA mind does, it tries too hard, it’s an awful experience. It just doesn’t feel good. And I’m more trained that way, and I’m very good at all that stuff, but my natural way of being is not that. So it’s not so much of a struggle. It’s more trying to remind myself. Thank you for explaining that. And forgive me for following your riff there – I just thought it was so interesting. People struggle with that, in the art world certainly. It’s almost too easy to tell people not to sell out. But we want to find an audience for our work. And when it comes from, as you say, unmixed energy, it’s coming from such a pure place, and it can do good things, as your work has done for me. It becomes yours. I don’t even think about you when I see that piece. I have a relationship with it. I have a couple projects. I’m working on some new paintings. And I’m trying out some new firing techniques. So I don’t know what will happen with that. But I have two new projects. The one that I have been thinking about for a while is about showcasing other aspects or dimensions of individuals. I’m hoping to launch it next year. The idea is to have people take the back side of their business card and write, draw – say something about themselves that is not there job. We always tie our identity to what we do – our job and our society has instilled in us that we are one dimensional beings when in reality there is more to us than what we do for money. Much more. So if you go to a cocktail party, people ask what do you do. And people always say what is on their business card. It’s like, oh, I’m a manager, or I’m a teacher. It’s all one note. So my project is probably the most interactive thing I’ve done. I want people to take the back of their business card and draw, write, anything that is something beyond what is on the front side of it. And put that all together. So if I was doing it at an organization, it would be all the people participating in that organization, and just to see, if you hang it like a mobile, the multidimensionality of people. And it is a way to just start thinking that your jobs are not all that you are. You are much more than that. And I think currently, with the economy the way it’s been for a while, people are so focused on jobs, in the news, and with the elections, it’s just jobs jobs jobs, and you’ve gotta create jobs. And I don’t believe that’s the way to go. I think things are going to really shift. And it’s going to become more about who you truthfully are and not about going out there to make money so you can consume. Because society was set up that way, thanks to Henry Ford, so you could consume. And so many people are stuck in that. So just to get people to start thinking. And in conjunction with that, I have all my old business cards, because I’m an artist and I love paper, and I can’t throw anything away, so I just have all these drawings on the backs of them. I am going to make just one big piece out of that. So that is an important project for me. And I’m a little concerned that people will be put off, that they will be afraid to put something on the back of their card. So I’m trying to think through how to word it. Since it will be participatory, are you conceiving it as a project that will be performed on a very ad hoc basis? Or will you have a gallery set up and ask people to participate? I’ve seen some installations with a miniature clothesline ready to go, and people are asked to participate like that, or I can see you giving a series of small workshops in which you invite people to bring their cards, and then maybe the fear factor is taken away, if they’re in a small group and everyone is doing it. Yeah. I work in wellness, and I’m doing a project at a not for profit right now, and what does that really mean? I think this is an important component of it right now. I’m thinking of doing it there in small groups like you said. I initially thought I could do this online, and people would just submit their cards, but then I thought how would people find out about it? Obviously I could put it on Facebook and Twitter, but it’s not the same. I thought it would be better to start this way. I’d love for this to become like you said, that the work becomes yours and you do not even think about me. That’s the ultimate goal. And this really takes it outside of me. I am just creating the space for it. It seems that it would be about the viewing subject’s relationship with the Self. That you’ve given them a space that allows them to efface the layers and the veils that they’ve set up for both themselves and for other people. My ultimate mission or goal in life is for people to realize or understand the idea of possibility and that they themselves are creative. I think we’ve been trained not to think about ourselves that way. And we all are, just by the fact that we exist. We are constantly being created. We are creative energy manifest. We tend to have something we are looking at from which we draw inspiration, but it might not be an artist working in the same area in which we are working. But it could be anybody who’s been an important influence. I don’t have a few main people. Some are not actually artists but are people who instead were great supporters and collectors of art. Because I think it goes both ways. You are engaging and creating either way. So I have a list here. I had to write it down. I love different textiles, patterns, and surface designs, and I don’t have a specific one that I can say inspires me. I just go online and start looking around. The same with a lot of older Islamic art. It’s very important to me. I think it is so beautiful. And the detail, aside from it being beautiful, is very grounding. There is something very grounding about looking at work that is so detailed. 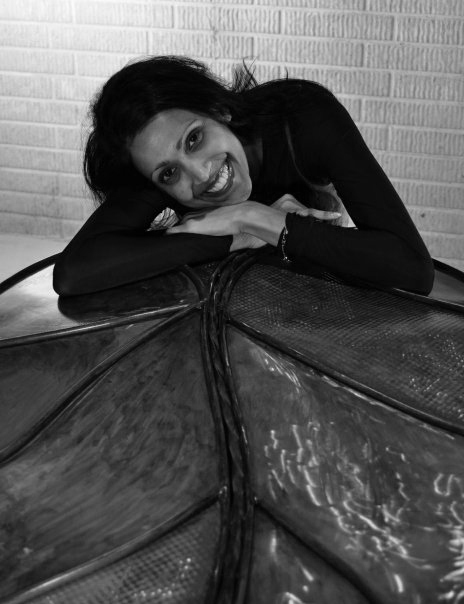 A contemporary artist from Pakistan who lives here in the US, Shazia Sikander, I love her. And I love how each new show of hers is not like the work she’s done before. All her work is beautiful, but sometimes if you look closely it’s not a beautiful topic. So I find it very interesting. She is about my age. I like Tara Donovan. The work I’ve seen is so amazing. She does installations. And it could be done with drinking straws, or pencils, or scotch tape, and that I think is amazing. And I’m very inspired by Frank Gehry, places of beauty to live. And Richard Go. And I don’t know if you’ve heard of Tony Duquette. He’s from the fifties or so, really ornate movie sets, and he’s done people’s homes, and he is basically a crafter gone wild. He doesn’t let anything go to waste. So I have the book of his work. And Anthony Gaudi is a big inspiration of mine. The lids from my abstract trunks came from him. There are some book artists I like. And they take books and make art out of them. So they are not necessarily creating beautiful books. The list is really long. You probably know who Charles Lang Freer is. He was an amazing person, in terms of the kind of art he was interested in and bringing it to this part of the world (the Midwest). I’ve been to his home here in Detroit. Everything is so beautiful, the windowsills with all the layers of paint, everything always changing. I think people’s lives and how they create, even cook, is fascinating. I like this chef in Chicago – Grant Achataz – he has a restaurant called Aliniea. He is dedicated to creating an experience. And it’s not the typical let’s go out and eat and have this nice meal that fills you up. It’s more about the experience. He pushes himself really hard. It’s different, and it’s interesting to me. I just get inspiration from wherever. A lot of car designers, jewelery. It’s interesting how all of these different ideas overlap and come together. We were talking about influence. One of the reasons I asked about your shows is not for the usual reason that people ask about a show. People get so competitive and crazy and brutal and weird and catty when they ask about shows. When I ask about shows, I ask because I wonder whether people will have the benefit of experiencing multiple pieces of your work at once. That’s what a show is for me. When you’re thinking about having small group workshops in order to work through the ideas in your identity project (with the business cards), and please forgive me for calling it that, it’s just the first thing that came to mind. But I wonder whether you see a future in which you’re designing through your work the impact you will have on other people. And do you think that impact will be an expressive impact? Or what form do you think that will take? What kind of influence do you hope that your art will have, or that you will have as an artist? I do think about what you just said. I think about how, the designing of it so it does have an impact. I hope it inspires people to learn more about themselves. It’s about awareness. So if they are engaged, with a body of work at a show or just with one piece, I don’t want to name it. I don’t name anything. And I don’t frame them. Because I think the fluidity of not telling someone what to think will help them naturally resonate. Am I answering your question? Yes, because on one level the question had to do with the influence that you hope you will have on individuals. What kind of influence as an artist do you want to have? And I was thinking of the workshops. You want people to engage the workshop so they can engage an idea that can become part of an installation. Have you thought about sharing the hows? Sharing the creative process? Do you think that is one way you could influence people? Or your style of work – people could look at your work and think I would like to produce something like that? Is it more about the energy in the process? Or the work itself? I think it is both. Because it is the everyday artist I want to celebrate. The artist within everybody. And by engaging people in the process, I want that to be able to break some barriers and open some things up for people. And then people can see how they came together to create a beautiful piece of work. So I think it’s the process and the ultimate piece. And for people viewing, just the power of something simple and the collective. That’s what I am trying to do. It doesn’t have to be something really big. It can grow from something really small. I remember one of your pieces. And I would probably not remember it literally if I saw it again because I have an emotional memory of it. It was a deep almost blood red wash illumined with sort of a gold, shimmering sunset-almost yellow, along the top edge. And that is all I remember about it. And I’ve thought since then that I’ll know when I am living in a place where I want to stay because I’ll want to have a wall that looks like that. Even that sort of impact is powerful. Years after they’ve seen it, they remember what they saw once. Yes, and it’s because there’s emotional connection, and it is all through color. And beauty. And the thing that I am most interested in is beauty. I feel that we do not know what that is anymore. But it is so essential for our wholeness and well being. And people are attracted to things that are inoffensive and pretty to look at. But there is more to it than that. I can’t help myself. Since I am about that, I will create things that are beautiful to me, but that kind of engagement I hope inspires people to bring beauty to their own life. My favorite book that I carry around is called Beauty, by John O’Donohue. It’s amazing. And there’s been so much written about beauty. But I love that if you look at something that may or may not be beautiful, but you can tell that the artist was interrogating their own relationship to the concept of beauty, as they were creating, and it is in that interrogation that you can find the space that becomes your entry point. And then you become another participant in the conversation. And that is what I like. I do not like to be told what beauty is. Give me an entry point and let me discover it. So if you started with your sister writing plays, do you still write? I just started writing again. And I’ve been wanting to, I guess it’s been about a year now. It’s been start and stop. I convinced myself that I’m not very good at expressing myself with words. But I do not think that’s true. I think it’s just a story I’ve told myself. So I first started writing in a journal, which is kind of a new thing for me. And now I love it. And so sometimes when I’m done I open another notebook and I write a poem. I don’t know any of the standard formats or poetry forms. I just write the way I write. And I have pieces and bits here and there of actual prose that I want to start putting out there. I’ve just been a little stuck on the idea that it has to be perfect. So it is kind of a self imposed way to keep myself from doing it. So let me ask the animal question. I think we all have this other nature. And we all have some identification with some animal, even if it’s a symbolic identification. What is your animal? Oh, I love birds. I love the peacock, and the hummingbird. Cardinal. I love the cardinal. But birds make me very happy. There’s a book, Birdology, and each chapter is about a different bird. It is amazing. You know, they are dinosaurs. Bird – because of their beauty, they are old, they can fly (most), they are so different than us, their incredible diversity, and I think I was one in a past life. I like peacocks especially because they can digest poison. I love cardinals because they symbolize self-care and confidence. And hummingbirds for their speed. And it’s interesting, their deep history and their connection to everything that’s come before us that we can never understand. Their bones understand things that we cannot comprehend. They are so different from us. But I was just in Kroger a couple hours ago, and there were birds flying around. And I was thinking, people don’t even notice because they are so used to having birds as part of their daily life. But they’re really different. And that mystery is interesting. They see differently, they feel differently. And we see them as things of beauty, as though they were art. If you think about the examples that you gave, how many paintings of cardinals are there? Or hummingbirds? And think of all the things we do with peacocks. Peacocks are sort of walking art. They’re mean art. Those are interesting choices. I don’t think I invented it, but in my style of painting, it looks like a feather. Each one has many colors. I paint a lot of abstract birds and dragons. That is where it came from. So much of your work I’ve seen is a sort of lyrical sensual abstraction. When did you find that voice, and how have you seen it evolve and develop over time? I feel the voice was always there – at least hints of it. And then I stopped creating for 10 years. When I started again – I started painting and it was the first time that I painted. It was very freeing and as I painted each next piece there was more and more lyrical opening. The whole act of taking a brush with paint onto a surface is lyrical to me. I painted to music and dance is an important part of my inspiration so It translates that way. As time passes, I became more and more in tune with that so my style I think has gotten fuller/ stronger. I create trying something new, accidents and experiments lead to more of a specific style as well as evolve it. What is the confluence of text and the visual, or idea and form, in your work? I am informed by concepts, ideas and visuals. I think in images. I have loved reading since I could read and actually won a prize for reading all the books on a summer reading list. I once broke my toe because I was walking and reading a book at the same time. The reason why I love to read so much is the visual images conjured by and because it was from text – a story many times there is a lot of texture from which to inspire me. Do you find your style evolving as you continue to create? Yes and also growth is circular or rather not a straight line. So depending on how I am feeling emotionally it changes and also over time – the more I create the more it evolves – it is almost like periods where works look one way and then I decide to try something new. I am always looking to experiment and try something new. Repeating is not inspiring to me. Do you have a process for beginning new work? Do you tend to plan or see it as New Work in a Certain Form, or do you just gather materials and Go? I gather materials and go. I find thinking about it too much is not helpful. Being present as it unfolds is best for me.